She walks through the door of a Raleigh, North Carolina, nursing home and residents start smiling. 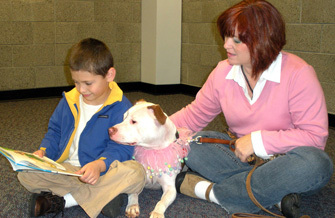 Later, she appears at a children's book-reading club and becomes the center of attention. Cricket the therapy dog is in the house. Cricket is like most therapy dogs; she's sweet, easy going, and evokes a feeling of warmth, love, and sweet understanding. What's unusual about her is that she's not a Golden Retriever, Labrador, or even cute little lap dog. Cricket is a pit bull. The very same type of dog that usually makes the headlines for all the wrong reasons. Cricket is truly the stereotypical pit bull terrier type dog, not the sensationalized marauder that the media would have you believe. Paige Burris is Cricket's human, as well as education specialist, positive reinforcement dog trainer, and behavior consultant. She rescued Cricket from a shelter when she was seven months old. "When I got her, I learned how much trouble the breed was in, and being the perpetual supporter of the underdog, I wanted to help them any way I could," says Burris. "I have always thought the best way is to show pit bulls in public in the most positive way possible, and leave everyone we meet with a positive impression of the breed. So after Cricket achieved her CGC Canine Good Citizen (CGC) certification in record time, therapy work was the next step toward making her an ambassador of the breed. She excelled and continues to excel beyond my wildest dreams!" 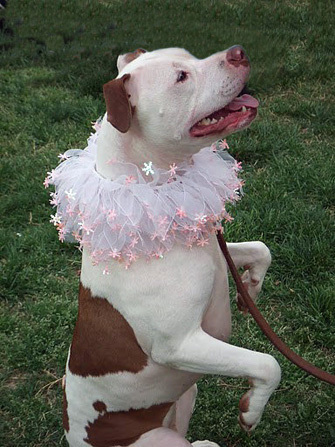 Whenever she appears in public, Burris adorns Cricket with colorful "clown" collars which always seem to get attention and precipitate a conversation. It's a chance to educate another person about the plight of these dogs. It's with that in mind that Burris started The Positive Pit Bull, an organization that focuses on training, education, and socialization with the goal of keeping more pit bulls from entering the shelter system. "We're working hard to change minds about this most deserving breed, says Burris. "A breed once called 'America's Dog' because of their loyalty and devotion to the family, is now the most highly euthanized dog breed across the country....it's insane! Very sad and so unnecessary!" While most patients invite Cricket eagerly to their side, some are a bit hesitant to have Cricket come up to them for therapy. Burris doesn't force the issue. She simply asks if they would wave and say, "Hi, Cricket!" When they oblige, Cricket always responds with a big smile, tail wag, and she lifts her paw and waves back. Burris says, "It's amazing to actually see someone's mind change ... and it is quite palpable ... someone's face, just after experiencing Cricket's infectious enthusiasm or sweet, calm demeanor during a therapy visit, upon hearing she is actually a pit bull, goes from pure joy to quizzical, confused, as if they are thinking, 'But I thought pit bulls were vicious!' " If nothing else, that's one more person who just might look at pit bulls in a new light. Cricket doesn't stop with therapy work at nursing homes and children's book circles. The lively two-year-old is always on the go. Soon she'll be representing pit bulls in the Susan G. Komen Race for the Cure cancer walk. Cricket is part of the Positive Pit Bull's awareness campaign called Pits4Ta-Tas, a bully-loving group that will walk to raise money for the Komen cause and enlighten the public about the negative stereotypes that plague pit bulls. Cricket is a shining example of what pit bulls are capable of in the hands of responsible owners. Just ask the kids who squeal with excitement when Cricket shows up. "Aww! Cricket is so sweet," one child says. "Can I read to her?" Then there's Minerva, one of Cricket's "regulars" at the nursing home who, at age 87, says, "I just love dogs. Cricket is perfect just the way she is: full of love and happiness. She brings a smile to the residents here and brightens the day for so many." Cricket also spreads sunshine when she visits patients in a local hospital. Her schedule is busier than most people's. But it's all in a day's work when you're a pit bull ambassador! Says Burris, "Anyone who knows anything about these breeds knows that their most endearing trait is their unshakable desire to please people. I would say that for most people, once you've owned a pit bull, it is nearly impossible to ever want to own another breed. This is due to their loyalty, devotion, intelligence, versatility and ultimate fun factor! It's a combination of traits that is hard to beat." Learn more about ending breed discrimination.